Styled on the military regulation dirk and much favored by Scottish Bandsmen, this impressive 18" full size Scottish Dirk has a polished 12" steel blade etched with traditional Scottish thistle and foliage decoration. A black leather covered scabbard, capped with nickel mounts is included. 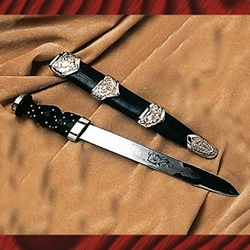 The dagger features a military regulation Queen's crown pommel over a black basket-weave, steel studded grip. A superb reproduction.